Thousands of fast food restaurant employees walked off the job on Wednesday in order to rally for higher wages as part of a coordinated series of demonstrations held across the United States and the world. As sit-ins and other acts of civil disobedience continue from coast to coast, local reports from mid-Wednesday suggested that planned protests had so far been largely well attended in cities including New York, Detroit, Chicago and Los Angeles. Demonstrators had announced previously that they’d be rallying across the US on Wednesday, April 15, to push for increasing the nationwide minimum wage to $15 an hour. More than half of American fast-food employees depend on public assistance to make ends meet, according to a 2013 report by the UC Berkeley Labor Center, and researchers there said in a report published this week that the majority of Americans who survive off of government assistance are nevertheless members of working families. In Brooklyn, NY, a group of around 300 protesters chanted “What do we want? $15! When do we want it? Now!” as they marched down Flatbush Avenue early Wednesday, according to CNN. Later on Wednesday, hundreds of protesters joined to march through New York City towards Times Square. McDonald’s, the iconic American fast food chain, said earlier this year that it’d increase raises for employees at around 1,500 corporate-owned locations. The company’s CEO, Steve Easterbrook, said in an op-ed published recently that the pay hike and other perks are "an initial step" and he wants to transform McDonald's into a "modern, progressive burger company." Roughly 90 percent of the corporation’s workers won’t be affected by the pay rise, however, and protesters are asking the rest of the industry to rally for increases across the board. Near Central Park, demonstrators pointed to their inability to properly feed their families on current wages. Protesters eventually arrived in Times Square with their message. Across the East River from Brooklyn, hundreds of protesters staged a “die-in” outside a McDonald’s location on the Upper West Side early Wednesday. 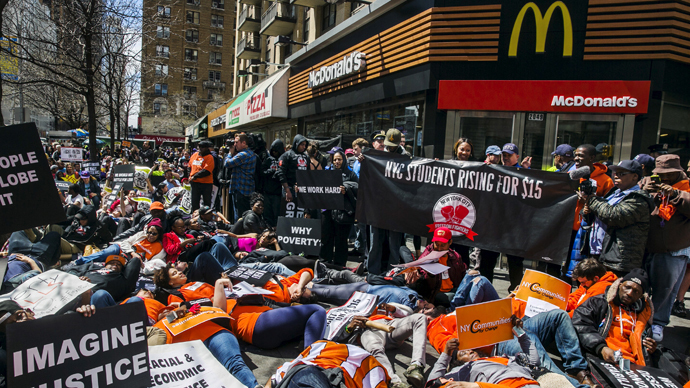 Robert Ascherman, a student organizer at NYU, told the Guardian that protesters in Manhattan led chants of “We can’t breathe on $7.25”—a reference to the minimum wage many fast food workers earn and also a homage to a slogan adopted by the Black Lives Matter movement in recent months following the death of Eric Garner, the African-American man who died last year while being arrested and placed in a chokehold by the New York Police Department. "I'm not just fighting for me — I'm fighting for my kids," Rod Livingston, a 27-year-old who works at two fast food jobs in Florida, told USA Today at a protest this week held outside of the McDonald’s he works at. Former US Secretary of Labor Robert Reich joined protesters at a McDonald’s in Oakland, California. Reich led the Department of Labor during the Clinton administration’s first term. In Detroit, meanwhile, some 700 people took to the streets to demand better wages. "It's hard for me to provide for my daughters with $8.75," another McDonald’s worker across the country in Manhattan told Reuters this week. Earlier this year, Wal-Mart Stores Inc said it would hike its minimum pay this year and next, and retailers Target Corp and TJ Maxx said they’d soon be implemented raises as well.